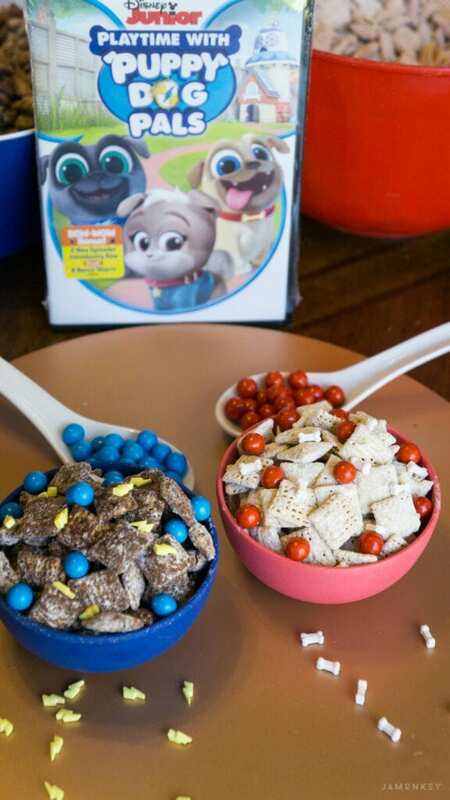 Chow down on this tasty Puppy Dog Pals Chow. 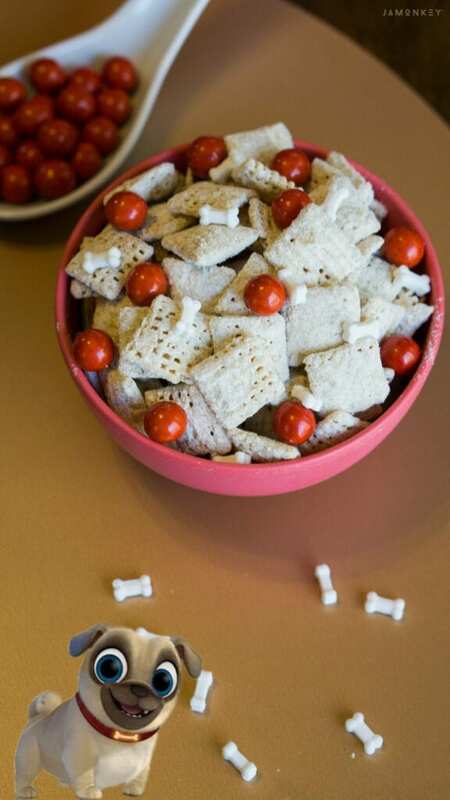 Made with Bingo and Rolly in mind, this puppy chow (Chex muddy buddies) is themed for each of these cute pups. Enter to win the DVD at the bottom of this post! Adorable puppy brothers Bingo and Rolly are back! Join the doggy duo on amazing missions: deep-sea diving in the Great Barrier Reef, fetching a four-leaf clover in Ireland, running all over Down Under, and much more! Then, meet their brand-new puppy pal Keia in two exciting bonus episodes! Packed with action, music and a ton of silly fun, these playtime adventures will leave you howling with laughter! PUPPY DOG PALS: PLAYTIME WITH PUPPY DOG PALS is available on Disney DVD now! To celebrate the launch of the new DVD I made this fun recipe to look like the brothers. 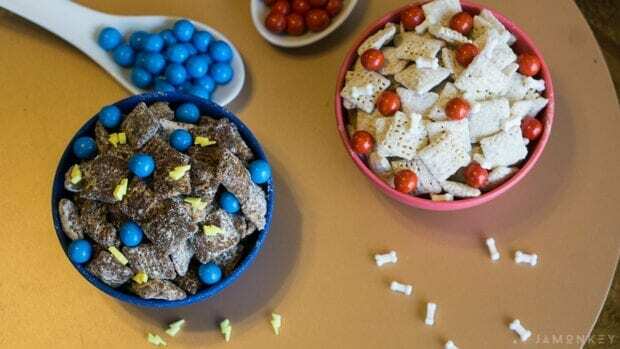 Each bowl is a different flavor puppy chow. The Bingo Puppy Chow is a chocolate Chex Muddy Buddies blend with cocoa blended into the powdered. I then used lightning bolt sprinkles and blue chocolates (Sixlets) to look like Bingo's collar. 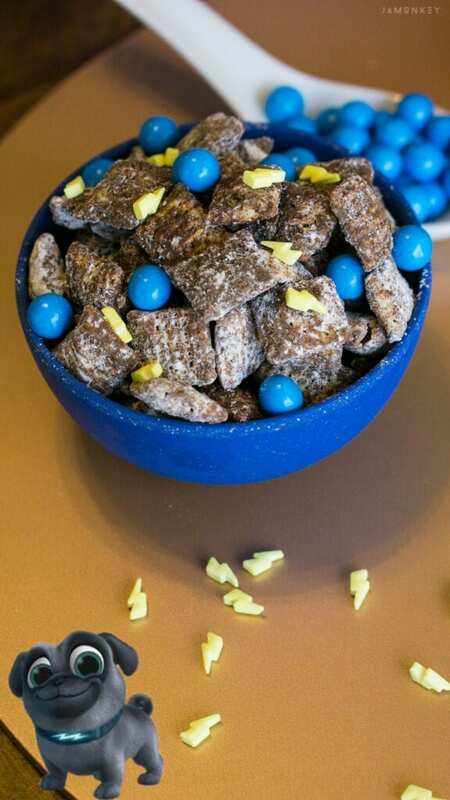 The next one is the Rolly Puppy Chow, which is a Peanut Butter Chex Muddy Buddies mix. This one is my favorite because of all the peanut butter flavor. I added bone sprinkles and red chocolates (Sixlets) to look like Rolly's collar! In a large bowl, measure cereal; set aside. In a 1-quart microwavable bowl, microwave chocolate chips and butter uncovered on High 1 minute; stir. Microwave about 30 seconds longer or until mixture can be stirred smooth. Stir in vanilla. Pour mixture over cereal, stirring until evenly coated. Pour into 2-gallon resealable food-storage plastic bag. In a bowl mix powder sugar and cocoa with a whisk or fork. Add powdered sugar to plastic bag. Seal bag; shake until well coated. Spread on waxed paper to cool. In a 1-quart microwavable bowl, microwave peanut butter chips and butter uncovered on High 1 minute; stir. Microwave about 30 seconds longer or until mixture can be stirred smooth. Stir in vanilla. In a bowl mix powder sugar and powdered peanut butter with a whisk or fork. We like all of the puppies but Rolly is our favorite. I would like the Bingo one because chocolate is amazing. I would like the Rolly Puppy Chow. I think that I would like the Peanut Butter Puppy Chow the best. I like Peanut Butter. 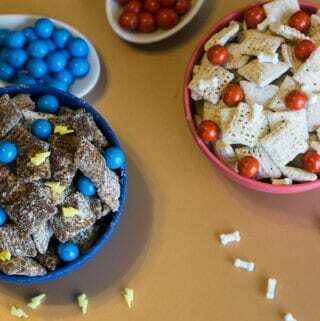 I think my favorite would be the Bingo Chocolate Puppy Chow!